Vancouver, BC - Skyharbour Resources Ltd. (TSX-V: SYH) (OTC Grey: SYHBF) (“Skyharbour”) is pleased to announce additional results from the 2013 radon sampling program at its Preston Lake uranium property. Many of the radon anomalies fall within prospective exploration corridors delineated through extensive summer airborne geophysics and ground evaluation. Radon survey results were instrumental in identifying first pass drill targets at the nearby Patterson Lake South (PLS) high grade uranium discovery as well as the recent discovery of the R600W Zone which is on trend with the western portion of the Preston Lake property (see Fission Uranium’s News Releases dated May 6, 2013 and November 4, 2013). 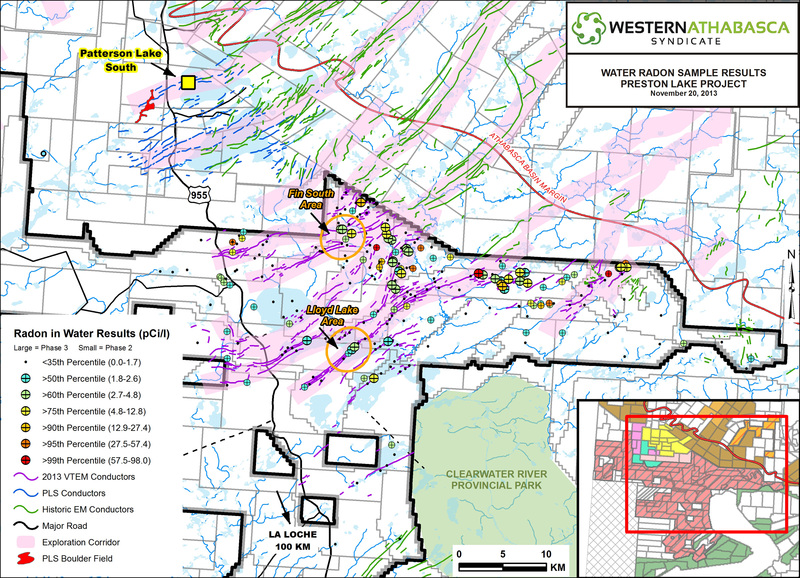 The 246,643 hectare Preston Lake property is the largest land package proximal to Alpha Minerals Inc. and Fission Uranium Corp.’s PLS high-grade uranium discovery. 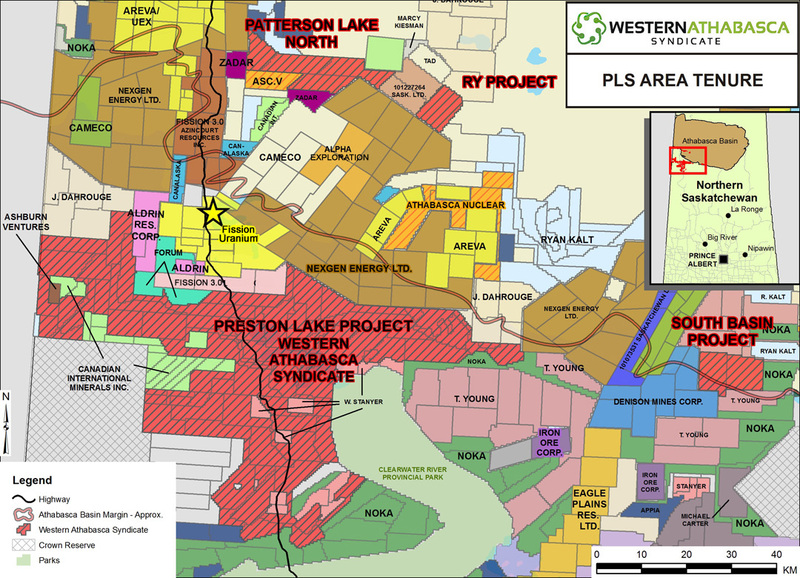 The Western Athabasca Syndicate (the ‘Syndicate’) holds title to the Property and consists of Skyharbour Resources Ltd., Athabasca Nuclear Corp. (TSX-V: ASC), Noka Resources Inc. (TSX-V: NX), and Lucky Strike Resources Ltd. (TSX-V: LKY). A total of 95 radon-in-water samples were collected from the Preston Lake uranium property during the October work program to augment the 291 samples collected earlier in the year. Sample targets include regional reconnaissance areas, high-priority targets and exploration corridors identified by the Syndicate’s Technical Committee, and areas of anomalous radon identified by earlier work. The samples were analyzed for radon in the field by Terralogic Exploration Inc. using a Pylon AB5 Series Portable Radiation Monitor which provides real time analysis of radon levels in both water and soil. The survey was successful in identifying a number of additional radon-in-water anomalies occurring both as clusters and as discrete points. Of particular interest are the two sets of anomalies located on the central and southern arms of Lloyd Lake that are coincident with previously identified conductor trends within a high potential exploration corridor. The Lloyd Lake setting is similar to that of the Patterson Lake area, host to the recent PLS high-grade uranium discovery, and will be a priority area for further diamond drill target delineation this winter. In addition, a new target area termed ‘South FIN’ at the Preston Lake property was delineated following the discovery of a distinct radon-in-water cluster coincident with a strong conductor axis and associated structure. This target is also coincident with the merger of two well defined high potential exploration corridors. Final data integration is nearly complete with ground radon and gravity survey contracts nearly secured. The ground surveys, for final drill targeting, are anticipated to commence before the end of the year.